Till's Import Car Clinic is a family owned and operated auto repair facility serving the southwest Florida area since 1991. 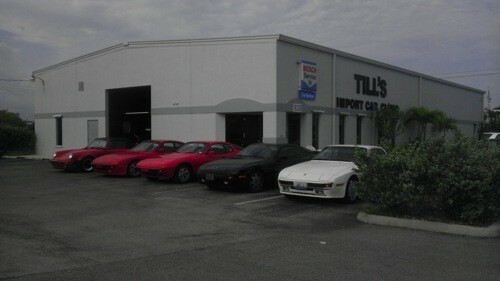 At Till's we specialize in the repair and maintenance of your Volkswagen and other European import vehicles. We have always prided ourselves on doing quality work for a reasonable price in a timely manner. Please call or stop by for all your vehicle service needs. I will continue to use Till's. The service and all was exceptional. I have already recommended you to friends! All is a big thumbs up for me! Love Till's! Very happy with the quality of services that I have been receiving from Till's. I was worried that we weren't going to find a place that we trust as much as our old mechanic back in our hometown. But Till's put that worry away. I love it here. My Passat has many miles on it, but it runs like it is brand new. The guys at Till's do a great job keeping up with my car. They are awesome at answering questions I have and they go above and beyond to make sure that I am getting 100% taken care of and nothing less. Our VW Toureg has more zip than before! The service people are super friendly and helpful. The pricing was very fair, and completed on time. I will be returning for my future service needs!! The team here at Till's Import Car Clinic are all very honest, friendly, excellent people that provide reasonable prices and get the work done right on time.